This helmet design is aimed at trail riders. This is a really nice helmet for the money and offers good protection over your typical road / XC helmet. It has a nice dial for adjusting the tension on your head and also allows you to tip the helmet forward or backward. It is aimed at trail riders and not a road helmet. The visor can be detached, but I do not believe it is meant to be quick detachable. The visor does adjust up and down, but I would just prefer it to be locked in the down position. I’ve always had issues with hot spots or pressure points with helmets on the upper rear part of my head and this helmet is much better than previous cheaper helmets that I have owned, although I did feel that pressure point on occasion after really long rides of 3 to 4+ hours. I wore this helmet for one full season, but have since switched to the Rudy Project Windmax helmet for most of my riding as it is aimed more at my style of riding, which is endurance XC or road rides. 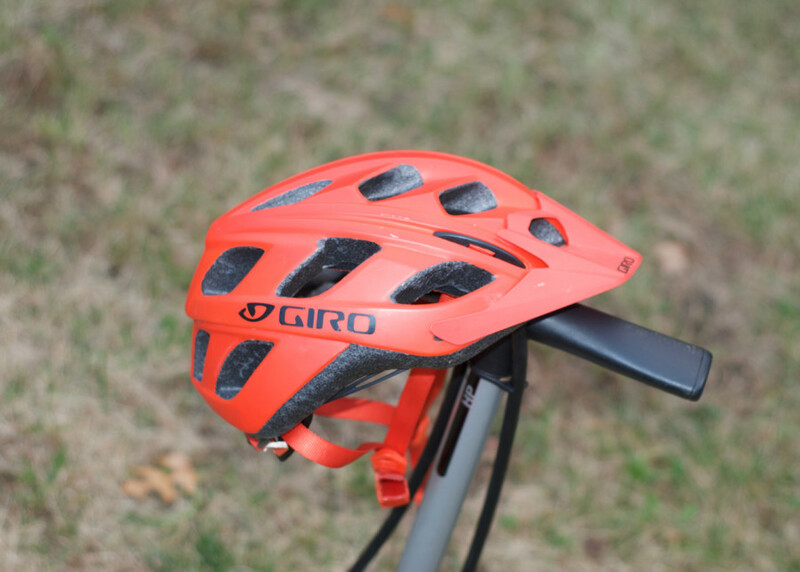 However, Rudy Project does not make a trail specific helmet and I will still wear the Giro Hex ocassionally on shorter training trail rides that might be a bit more rugged of riding. Adjustable Visor – The visor is adjustable, but I probably would prefer it to just be fixed it in one position. Without reading the info on the helmet, you might just think that the visor movement was because of bad attachment design. That being said, some people might like it. In-Mold Construction – The entire foam section of the helmet is molded into a polycarbonate shell. This is a really nice feature for trail riders that most helmet do not have. Most helmets have the plastic oversold, but do not cover the lower rear half of the helmet and this one does. In the event of a crash, this helps hold the helmet together and spread the impact out over the a larger area. This was actually one of the big selling features of this helmet for me when I purchased it. Roc Loc 5 Fit System – It has a really solid tension adjustment knob. Although a bit small, it is really solid and easy to use with gloves on still. I really wanted to rank this as a 5 star helmet because it is a really nice helmet for the money. However, I do feel a slightly better better padding design or more padding to the rear of the helmet would completely solve the pressure hot spot for me.